The neem tree, (Azadirachta indica) native to India and now being grown in Africa and the hotter parts of America, is proving to be a remarkable plant. The Indian nation has known of it's virtues for thousands of years, where the tree is known locally as the village pharmacy. The twigs may be used for oral hygiene (i.e. as toothbrushes) and the leaves and oil can be used in skin care. Indeed all parts of the tree in general seem to have some use. For a long time it has also been observed that if the leaves, or any part of the neem tree come to that, are used as a fertiliser around crops, the insect population amongst those crops decreases dramatically. It is this phenomenon that scientists in western cultures have been looking at since the 1960's as an alternative to powerful chemical insecticides. This tropical evergreen, that was first seen in east India and Burma, can be grown in any sub-tropical country where the temperature does not drop below freezing, in fact it will grow with very little water and in extremes of heat, with temperatures as high as 45 degrees Centigrade. The tree is often planted near houses, places of worship, along village roads and highways in order to keep the environment healthy. It is supposed to be able to absorb more carbon dioxide and atmospheric pollutants than other trees. Not a big tree at about 15 metres, it is closely related to mahogany and the wood, having a high natural oil content is prized for furniture as it does not readily rot. 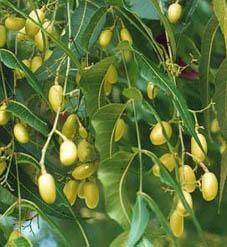 However, the main reason more and more people are growing the neem tree is for the production of neem nuts. It is these nuts that when cold pressed produce an oil rich in natural compounds that work together as an organic pesticide (the residue left after the pressing is used as an organic fertiliser). The main ingredient of this compound is Azidirachtin, which at only 1500 part per million (PPM) makes it incredibly safe for human use. It works by upsetting the insects' breeding and feeding patterns, thus with regular use an infestation can gradually be brought under control. Increasingly, approaches of this kind are seen as desirable methods of pest control: pests don't have to be killed instantly if their populations can be controlled in ways that are harmless to people and the planet as a whole. In the twenty first century this is particularly important: many synthetic pesticides are being withdrawn, few replacements are being registered, and rising numbers of insects are developing resistance to the shrinking number of remaining chemical controls. Neem is proving to be immune to pest resistance in the 390 odd species of insects it is known to control and the residue left on the plant acts as a deterrent to re-infestation!